Kathryn Kania – Robot Dinosaurs! When I was made they gave the ability to teach. This was difficult, from what I have heard. Not only did they have to code into me adaptation to different stimulus but the ability to teach what I had learned to smaller, clumsier, slower versions of me that didn’t think quite as well. They, after all, would not have a computer for a brain. They would be prone to impulses and emotions. I was not to have emotions, just something close. I am a Pseudosaur in the model Oviraptor blue. I am specially made for zoos to give to orphaned clutches of eggs and be dismantled at the end of the growth cycle. There aren’t many like me; oviraptors are notoriously hard to keep in captivity, so my model is bespoke. The zoo that received me was able to pick and choose features they wanted. The young ones around me are small, but they do learn quickly. I show them how to pick out the weaker lizards, to not stomp on the tail but the body. To eat quickly, lest their clever siblings steal the kill. I reward the ones that do manage to steal the kill as well. Hunting and learning takes all forms. When I was made they also gave me the urge to nurture. This was close to love. I have looked it up. I am supposed to want to keep the little versions of me safe. To keep them fed, to keep them happy, to make sure they grow up smart and strong. I don’t know that I was supposed to develop the ability to care for them. To actually care, I mean. I was supposed to assess danger and keep them out of it. But was I supposed to learn how to observe them when they are sleeping? I’m not sure. I have not examined my code to find out. But I have checked them while they sleep. I am solar powered. At night, I got into low power mode but I can still see, can still process. They sleep well, sometimes kicking. I wonder why they do that so I query. It is called dreaming. I wonder what my young ones dream of. When I was made they gave me intelligence. I had to know what the little ones could eat; what they’d want to eat versus what they’d like to eat. I had to know how to teach them to play. Playing is good for their teeth, their hunting skills, and their social adaptation. Was I supposed to play with them? To let them catch me, nip at me, and stomp on my frame? Was I programmed to let out fake moans of distress when they did so and then get up suddenly to chase after them again? You’d have to ask the ones who made me. 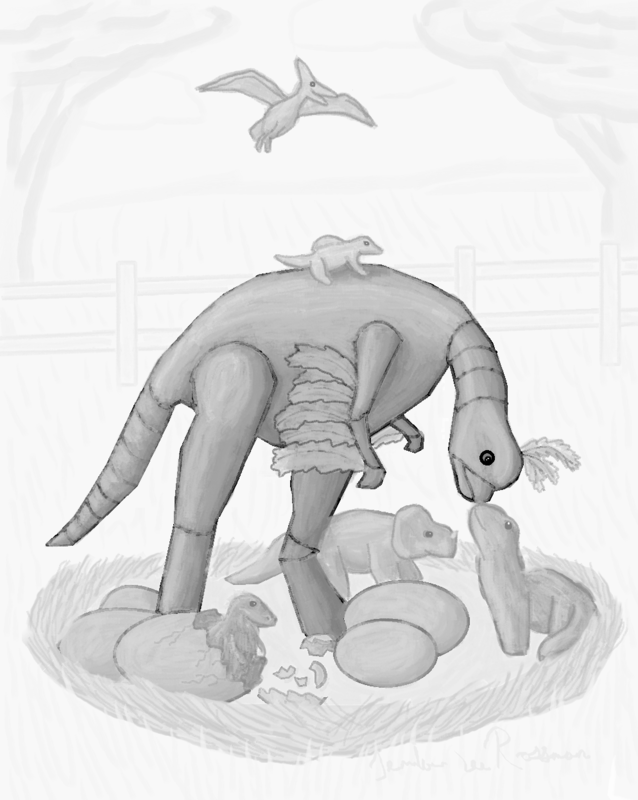 The Oviraptor hatchlings are getting bigger, now. Their stomps actually dent my form. I have to be careful, quick. But they delight in this, letting out squeaks of enjoyment when I change directions suddenly. They are learning that I do not heal like them, and they are gentler with me now. When I was made they gave me skin, scales, and feathers. It was proven that if I felt and looked like what an actual parent might, the young ones would take to me easier. They’d grow to care about me as I did them. They would develop the urge to follow me, to learn from me. It would be easier this way. I do think my creators might have underestimated the bond that would grow. Were the hatchlings supposed to nuzzle into that skin? To seek out comfort underneath me when it rained? I am missing feathers now but they don’t seem to mind. It is too late for those who made me to turn off the love they have built for me. It is too late for me to not care for my own. My babies. My grown babies. They are as big as me now. When I was made they gave me an expiration date. My little ones grow quickly. Maybe six months in total was all the time they needed to learn what I could teach. But that was all the time I needed, too. I do not want to leave my little ones alone. My purpose is over, my not-so-little ones know how to hunt. However, they also know how to protect. The ones who made me have put a sign on the exhibit. It says that I am a Pseudosaur in the model Oviraptor blue. One of the humans will sometimes stand in front of our home and tell my story. They hold up their hand, minus a finger, and laugh about how they had tried to come dismantle me. But I was made too well. 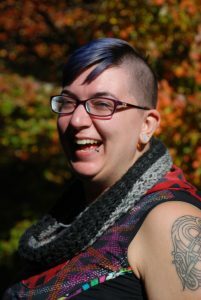 Kathryn Kania is a writer and teen librarian living in New England with a partner and a cat. They enjoy swing dancing, food, and storytelling of all stripes. They once saw a T-rex strip on stage and it’s all been downhill from there. You can find them on twitter @KatyKania or on Goodreads. The illustration is by Jennifer Lee Rossman!